The Olympic champ might just be back. From 2011 to 2016, Matthew Centrowitz was among the world’s very best 1500 runners, but he has not looked the same since winning 1500 gold in Rio two years ago. 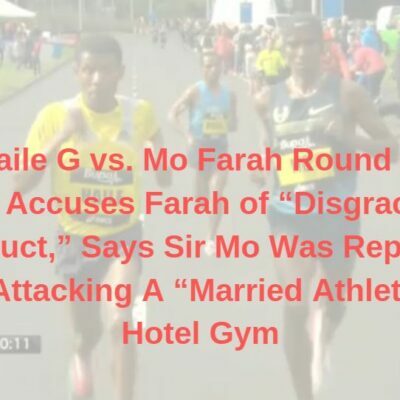 Part of that was due to a variety of maladies which afflicted him last year, including injuries to his hamstring and adductor and a bout with pericarditis, which led to him exiting in the first round of the 2017 World Championships. His 2018 season had not gone any better to this point as he could not break 1:52 in either of his 800s and finished a well-beaten 6th in the 1500 at Payton Jordan just two weeks ago. However, we got a glimpse of the old Centrowitz at tonight’s USATF Distance Classic in Los Angeles as he closed well to win section 2 of the 1500 in 3:38.99, after running a 1:48 800 earlier in the evening. Centro was not the fastest 1500 runner of the night (Johnny Gregorek ran 3:36.95 in section 1) but his performance was certainly the headliner from a distance fan’s perspective. 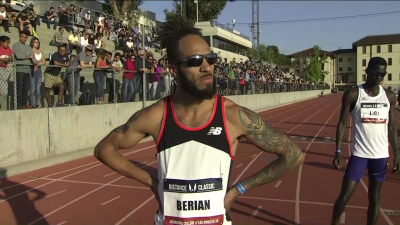 We have results of all the races below, including Boris Berian’s difficult return to the 800, starting with a recap and analysis of the men’s 1500. The first two sections were meant to be seeded equally, but the first heat was willing to go with the rabbits and as a result the four fastest times of the night came from section 1. Leading the way was 2017 World Championship finalist Johnny Gregorek, who moved up to #3 on the 2018 U.S. list behind collegians Robert Domanic (Ole Miss) and Sam Prakel (Oregon). 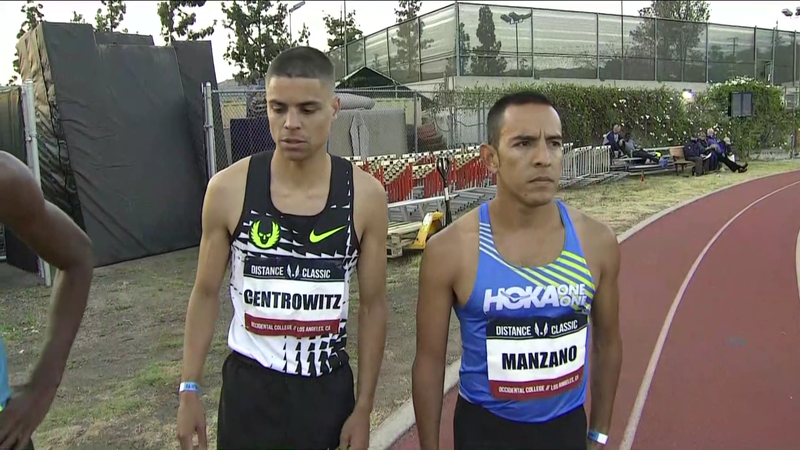 In section 2, Olympic champ Matthew Centrowitz — who was initially slated to run in the slower section 3 but decided to move up to the faster section — closed in 54.33 to impressively win in 3:38.99. The pace was relatively quick in this one as Australian Jordan Gusman was the first racer behind the rabbits at 57-mid at 400. They slowed over the next lap, hitting 800 in 1:57, and Gregorek, sensing the pace was slowing, moved off of Gusman’s shoulder and into the lead, with U.S. 10k champ Hassan Mead moving into second. Gregorek continued to lead at the bell (2:40.89) and began to separate from the six-man chase pack on the first turn. Though the pack would close him down slightly over the final 200, no one seriously challenged Gregorek, who won in 3:36.95 thanks to a 56.07 last lap. Gusman got a PR of 3:37.52 in second, as did Oregon’s Blake Haney (competing unattached), who finished 5th in 3:39.07. 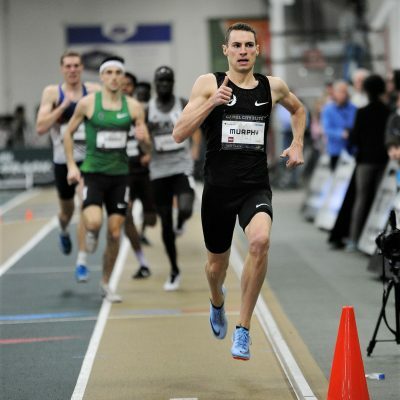 Afte rthe race, Gregorek said he’s ready to do something special in the upcoming Bowerman Mile: Johnny Gregorek Is Pumped for Bowerman Mile: “I want to really run something fast… I’m going up to Eugene now to get locked and loaded.”. No one wanted to run fast early on as the first racer at 400 (59-mid) was 21-year-old Algerian Takieddine Hedeilli. 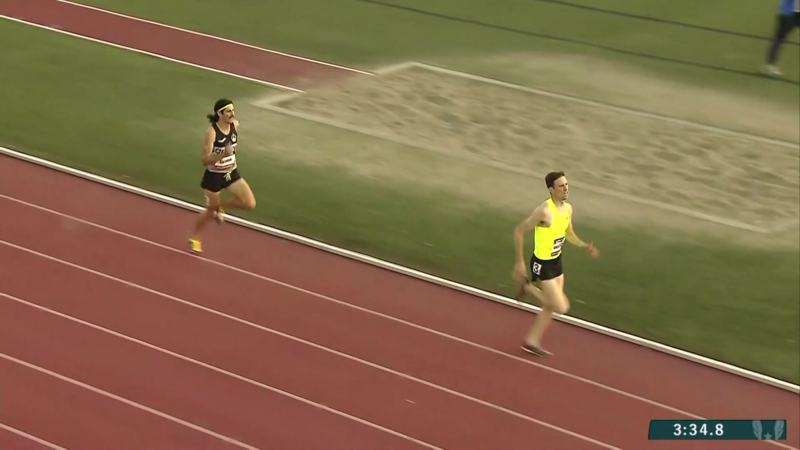 The next lap was even slower (1:59 at 800) as Colby Alexander moved by Hedeilli into the lead on the backstretch. But he would not be there for long as Hedeilli reclaimed the lead before the bell. Five men were within a second of him at that point, with Centrowitz, who ran the 800 just over an hour earlier, lurking in 6th after making a move to join the leaders with 450 to go. 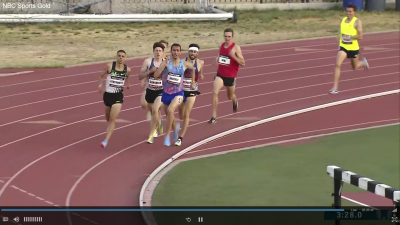 It was clear on the backstretch that Centrowitz was feeling good as he moved outside and began passing guys. With 150 to go, he was third, but coming off the final turn, Hedeilli still led. From then on, it was vintage Centro. At his best, Centrowitz can run incredible speeds without looking as if he is straining at all, and though this was far from his fastest close, we got a taste of that tonight as he pulled away to win in 3:38.99. 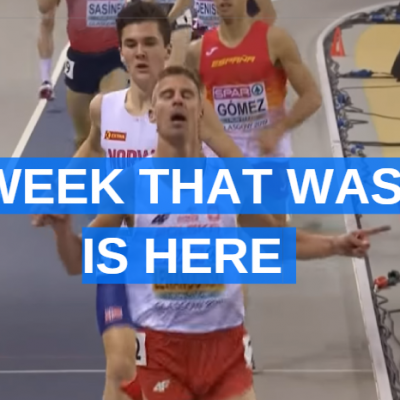 Kyle Merber was the only guy to mount a challenge over the final 50 meters after making an inside pass on the home straight, but he could not catch the Olympic champ and had to settle for second in 3:39.15. Merber knew he had a shot to win with better positioning, as shown by the tweet below. Kyle Merber and Colby Alexander aren’t world-beaters, but they’re solid runners, and to beat them on tired legs while closing in 54.33 is no easy feat. Whoever runs the NOP Twitter account was evidently quite excited as well. In the 800, Centrowitz was never really in the race, but he was moving well at the end and his 1:48.41 was significantly faster than either of his other races this year. 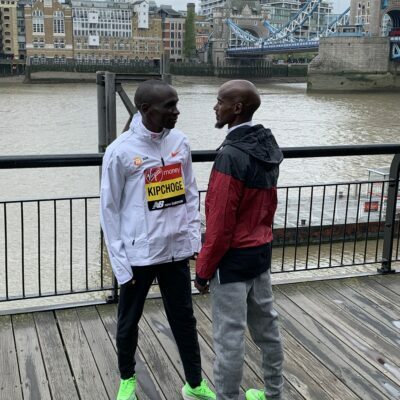 This was definitely a good sign for the Olympic champ, but his real test comes next week when he’ll face the world’s top two milers in Elijah Manangoi and Timothy Cheruiyot at the Pre Classic. 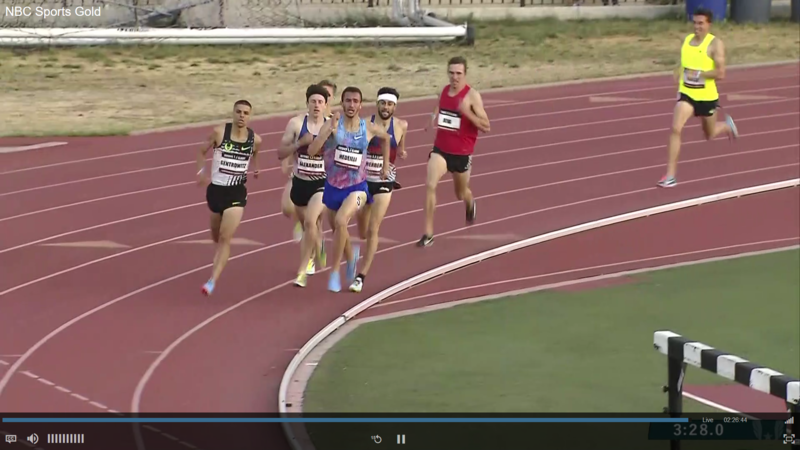 Centro will have to be close to PR shape (3:50.53) just to contend for the win there, but now enters the race with a reasonable chance to contend. 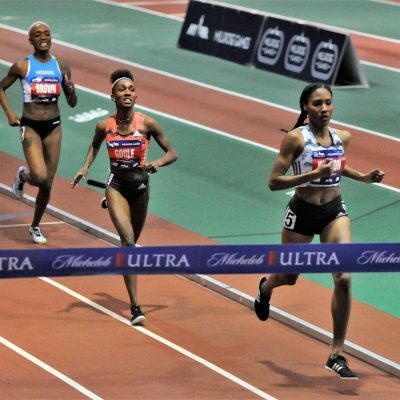 HOKA NJ*NY Track Club’s Ce’Aira Brown has already had a big year in 2018, running PRs at 800 (1:59.70) and 1500 (4:09.44) and she claimed her biggest scalp yet tonight, defeating 2013 Worlds silver medalist Brenda Martinez in convincing fashion. Martinez got to the front early and was right on the rabbit’s shoulder at the bell, which she hit in 58.56. But Brown and the Oregon Track Club’s Hanna Green were right behind her, with 2014 NCAA champ Laura Roesler giving chase in 4th. Martinez continued to lead down the backstretch as Roesler fell off, but Brown moved by her with 150 to go and Martinez had no response, as Green moved past her as well into second. It was all Brown in the home stretch, however, as she powered home to win by over a second in 2:00.38. 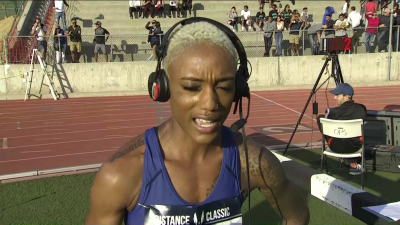 Many middle-distance runners move up in distance as they age, and Martinez said last year that she was planning on focusing on the 1500 this year and beyond (she’ll run that event at Pre next week). Assuming she has altered her training accordingly, it explains her performance today, as this (2:02.03) was Martinez’ slowest non-championship 800 since July 2015. Craig Engels prevailed in a tight three-way kick to win this one in 1:47.40. The race began with 2016 Olympian Boris Berian, running his second race of 2018, doing the same thing he did in his first race — going straight to the front. 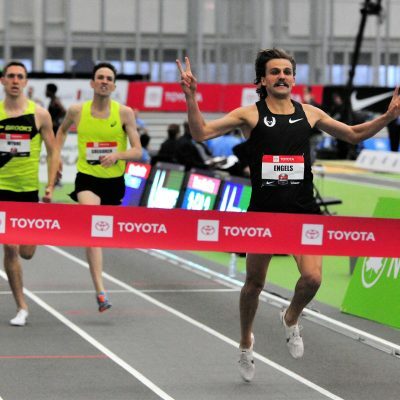 Unfortunately for Berian, the rest of the race played out the same way as that outing at the New Balance Indoor Grand Prix in February as he faded badly over the second lap after hitting 400 in the lead in 52.31. Berian would wind up 8th in 1:50.70. Instead, this one came down to Harun Abda (6th at USA Indoors this year), Iowa’s Carter Lilly (competing unattached) and Engels. Engels was in third coming off the final turn, but made a sudden move to the outside toward the start of the home stretch and held off Lilly to win in 1:47.40. Lilly, at 1:47.54, just missed his 1:47.32 pb from two years ago. Matthew Centrowitz was never a serious factor, but was able to drop Olympians Berian and Charles Jock to finish 5th in 1:48.41. Engels has been focusing on the 1500 recently, but tonight was a reminder that the guy is also a pretty good 800 runner — remember, he was 4th at the Olympic Trials in the 800 two years ago. Engels was pleased to win tonight as he said that Nike Oregon Project assistant Pete Julian told him to focus on that tonight rather than a specific time. Engels has been training at altitude recently, which he has not enjoyed. “It’s been rough but I figure you can fake an 800,” Engels said. Now Engels is heading back to Portland — and you could join him. He’s looking for a couple of roommates. Dont know how many weird hits im going to get but…. If anyone needs or knows someone who needs a place to live in Portland for a year, let me know. I have 2 rooms open in my house starting June 1. 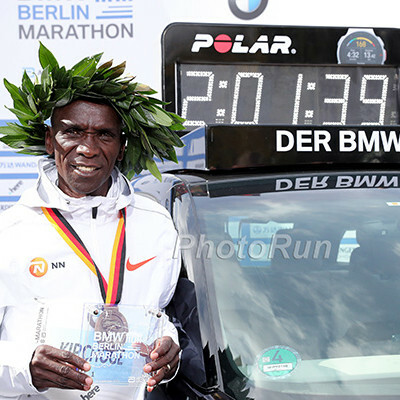 The knock on Berian when he raced indoors in Boston three months ago was that he didn’t have the strength to hold on for the final 200 after a hard first three laps. Unfortunately, he doesn’t appear to have made much progress in that department as he went 52.31-58.39 for an ugly 1:50.70 tonight. So the bad news is that it may take longer for Berian to regain his form following his Achilles injury — which, remember, kept him out for all of 2017 — than he would like. The only silver lining is that this is a non-championship year. Osika, who was 3rd at USA Indoors in February, was the favorite on paper here and delivered by earning a wire-to-wire victory. Osika led the entire way, but the racing really began with 500 to go when the rabbits stepped off. Eleanor Fulton, who was 9th at USA Indoors, had been on Osika’s shoulder for much of the race, began to fall off at the bell as Dana Mecke moved into second. But on the backstretch, Mecke too was passed as Danielle Aragon assumed second place. With 200 to go, Osika and Aragon had separated from the field and it was a two-woman race. Coming off the final turn, Aragon moved outside but she could not match Osika on this night, who closed in 62.68 to get the win in 4:09.38. Aragon actually closed faster (62.66) but was only third at the bell and thus had to settle for second. She won’t be too disappointed, however, as her 4:09.57 was a PR of almost three seconds for the Notre Dame alum, daughter of 3:51 miler Chuck Aragon, and sister of Stanford runner Christina Aragon. During her fifth year at Notre Dame last year, Aragon, the Notre Dame school record in the 1500, lowered her pb to 4:12.50 and made NCAAs for the first time individually (last (12th) in final) but today’s race was a huge breakthrough for the first year pro for the HOKA NJ*NY Track Club. 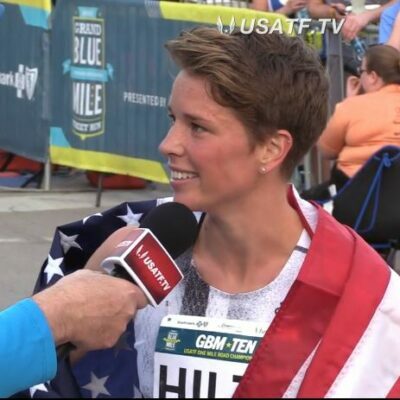 She’s now less than a second from little sister Christina’s PB as Christina’s pb dates from high school when she ran 4:08.71 to snag the bronze at world junior in 2016.